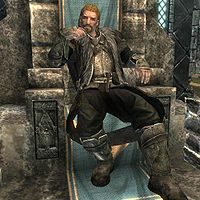 * Jarl Balgruuf is initially neutral in the civil war, but will ultimately declare loyalty to the Empire during Message to Whiterun, regardless of who the player sides with. If you join the Stormcloaks and complete the Battle for Solitude, instead of being exiled or killed, Jarl Elisif the Fair will be captured by Ulfric and coerced into renouncing her support for the Imperial Legion in favour of the Stormcloaks. Her steward, Falk Firebeard, interprets the act of allowing Elisif to maintain her Jarlship as a masterful political stratagem on Ulfric's part. Esta página foi modificada pela última vez à(s) 10h31min de 28 de agosto de 2015.